Self Portrait with Cougar explores how trauma can be retained in the body. 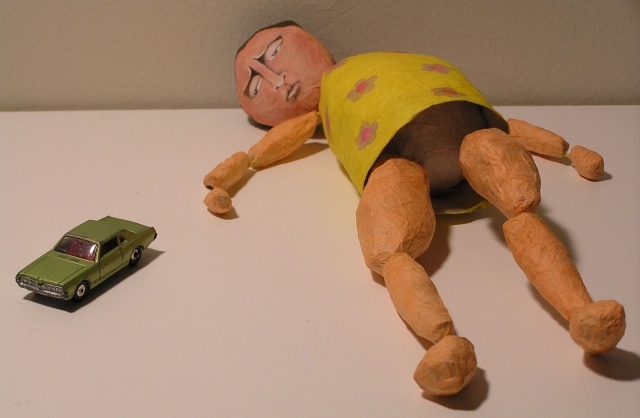 The gesture of the papier-mâché figure describes an immobile child engaged with a toy car. In the downward gaze of the eyes, the viewer is asked to consider the relationship between the vehicle and the child. She has been hit by the car. She is still alive, but unable to move, looking at the car. The toy car, smaller than the figure, drives away from her, and she watches it go. She lies exposed, vulnerable, and unable to comprehend the magnitude of what happened. The flowers, hole-punched tissue paper, were applied petal by petal to the field of yellow, and are another reminder of the innocence of childhood: the plucking of flower petals to foretell the future. She is left there, like a doll discarded.